Ruth M. Hartigan - Kain-Murphy Funeral Services-Serving Haddonfield, Cherry Hill, Haddon Heights, Haddon Township and surroundings. (nee Snyder) On April 3, 2019, age 94, formerly a longtime Haddonfield resident, wife of the late Martin; Loving mother of Dennis of Pine Island, FL, Donald (Cindy) of Parsonsburg, MD, Karen Snyder (John) of Wilmington, DE and the late Alan (Debbie) and Martin Barry (Debbie); Beloved grandmother of 12:Wade, Khara, Sarah, Kelly, Michael, Christopher, Rebecca, Joshua, Danny, Brian, Allison & Caitlin; great grandmother of Ruthie June, Tristan, Olivia, Isabella & Jacob and Dear sister of Richard Snyder. Ruth’s life was sustained by her family, faith & friends. After her husband was disabled, she learned to drive, went back to work and conquered challenges and struggles that made her stronger. She had been an executive secretary for various company including, 12 years at RCA. 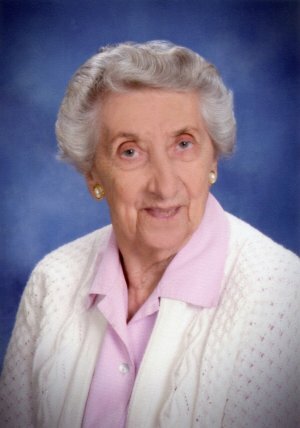 Ruth was a longtime active member of the First Baptist Church of Haddonfield, singing in the choir for over 35 years. She volunteered at WJ Hospital (Virtua) and later after moving to Riverview Estates, was President of the Resident’s Council (4 yrs. ), assisted with their newsletter, mailings and on their compassionate care team for residents without family. She embodied positivity, warmth and kindheartedness and will be deeply missed. Ruth’s family will receive friends on Saturday, April 27th, 10:30-11:15 AM, in the Sanctuary of the First Baptist Church of Haddonfield, 124 Kings Hwy. E., Haddonfield, NJ 08033; where the Celebration of her Life will follow at 11:30 AM. Interment, private. In lieu of flowers, memorial contributions in honor of Ruth made be made to her Church at the above address or the Riverview Estates, 303 Bank Ave., Riverton, NJ 08077, which her family wishes to express their gratitude to for their excellent care.